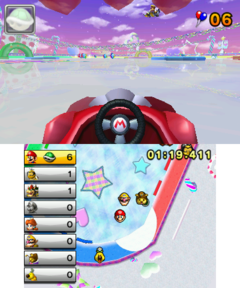 Sherbet Rink is a battle stage in Mario Kart 7 being similar to an ice rink. It is Princess Peach's personal battle track. This stage makes drivers slide on the icy ground and has some colorful borders around and four arches in multiple colors. There are several Penguins strolling around that push players back, as well as some Snowmen scattered around that make players flip over on contact. There are also giant rubber hearts and stars stuck in the ice that act as bumpers, knocking the racers backwards if they run into them. At the edge of the stage there is a colorful road where players can ride smoothly unlike on the ice and a crown-shaped border barrier. There are also several patches of snow that slow racers down if they drive over them. There are posters and billboard signs all over with pictures and words saying Peach and banners with hearts on them. In the back floating, there are lightly-colored presents, stars, hearts, and other decorations. The Prima guide lists the Penguins as a hazard that can spin players out so that a balloon gets popped; this is not true, however, since the Penguins simply push players around. This page was last edited on June 2, 2018, at 18:11.